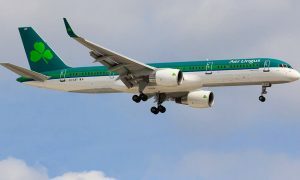 Aer Lingus Regional today marked the maiden flight from Cork to Newcastle as the airline completes the latest part of its ‘new beginning’ strategy. From today Aer Lingus Regional will opérate four return flights, four days a week to Newcastle Airport and is the airline’s 8th regional route from the airport. This follows the success of the airline’s Dublin–Newcastle route which went into operation last October. The airline expects to fly over 300,000 passengers from Cork, up 20% from 2013 as the airline aims to double passenger numbers to 2 million by 2016. The addition of this route will enable Cork passengers to have a direct route to a major business and tourist hub in the North-East of England. Equally it will facilitate a potential tourist influx from Northern England to Cork. The Cork-Newcastle route will be operated by one of the airline’s new ATR 72-600 aircraft which will offer better comfort and convenience for business and leisure passengers alike. An additional new aircraft will service Cork routes from the 14th of April. Stobart Air will also be investing €45million in new equipment. “We are delighted to announce the launch of the Cork-Newcastle route. It made sense to facilitate a link between these two vibrant cities. The route has enormous potential in terms of boosting tourist numbers and enhancing business connections between the two cities. This route will exploit the potential connections between the two regionals, particularly in the area of wind and tidal energy projects in the North East of England. The airline, which aims to double passenger numbers to over two million over the next five years, has overseen a 32% rise in Aer Lingus Regional passenger numbers in the 2013. Stobart Air now operates over 550 flights per week across 27 routes in Ireland, the UK and France.